Lisa Mitchell and Bruce Fabbri formed Clearly Speaking in 2008. We first opened our doors in July 2008 in Hampton Falls with Lisa as our initial Speech-Language Pathologist. We have grown steadily and expanded across New Hampshire since then, opening our Dover, NH facility in 2011. We ventured out of the Seacoast Area in 2012 when we opened a facility in Derry, NH, which has since re-located to our current address in Londonderry, NH. Lisa started the company with the goal of providing the very best pediatric speech and language therapy delivery in New Hampshire. Her vision is "to provide fun, effective therapy in a super kid friendly environment". Over the years, she has brought together a dynamic team of therapists that provide effective, measurable treatment. 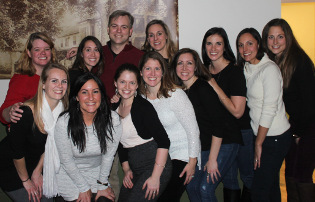 Our team prides itself in specializing in pediatric speech and language therapy. We work with children aged 16 months to 16 years. Many of our therapists bring more specialized skills to the table, including a specialty in Childhood Apraxia of Speech, Social communication skills, fluency, and feeding. We are always looking for the very best Speech-Language Pathologists to add to our team. We are very proud of the outstanding team we have assembled. If you are interested in learning more about joining us, visit our careers page.